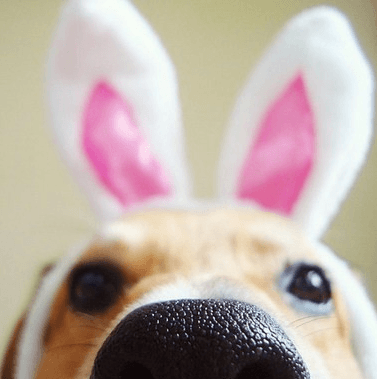 Penda Learning will be closed on Friday, April 19, 2019 and Monday, April 22, 2019 in observation of Good Friday and the Easter holiday. Normal business hours will resume on Tuesday, April 23, 2019 at 8:00am ET. Penda Learning wishes all students, parents/guardians, teachers, and school/district administrators a wonderful Easter holiday. ARE YOU USING PENDA LEARNING WITH FIDELITY? Each month, Penda Learning highlights a goal to guide students and teachers so they get the most out of Penda. Monthly goals are based upon Penda Learning's EFFICACY RESEARCH and latest IMPACT EVALUATION CASE STUDY DATA. Hot off the press! 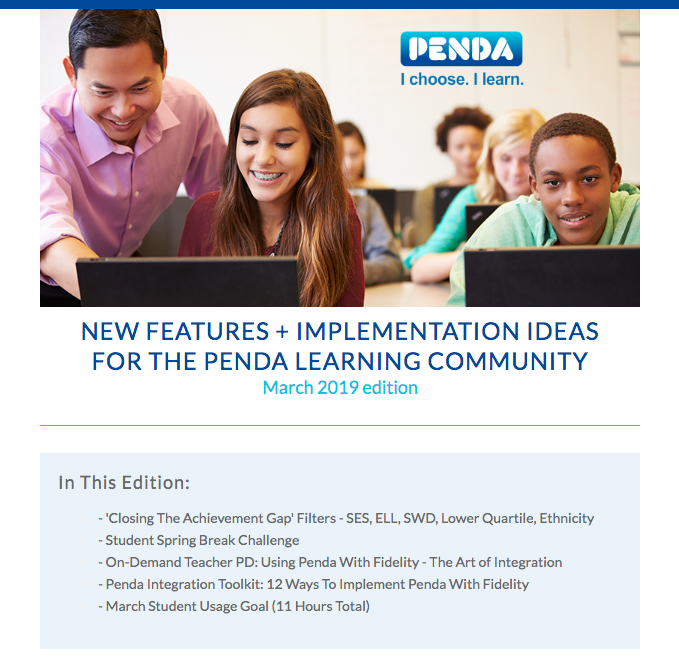 Penda Learning's March eNewsletter is now available! This edition is dedicated to closing the achievement gap using advanced data reports and progress-monitoring as well as using Penda Learning with fidelity. Be sure to check out the 24/7 online on-demand video included in this months enewsletter for self-help how-to guidance. 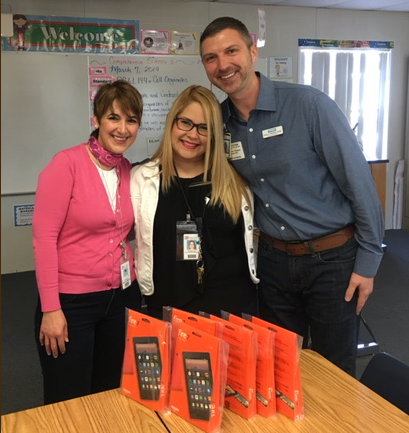 Congratulations to Ms. Frontanez of Hunters Creek Middle School (@HCMS_OCPS). 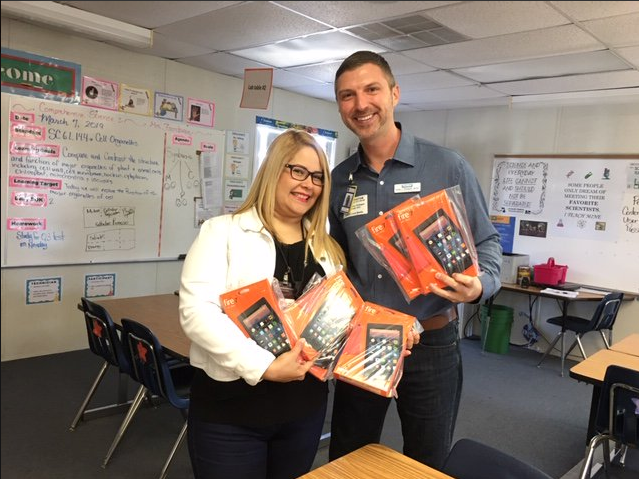 Ms. Frontanez was awarded with Amazon Fire 7 tablets as part of a Penda Learning Science give-away. Lots of teachers write in to ask about how they can create student incentives and challenges to help drive usage and get maximum results with students using Penda. 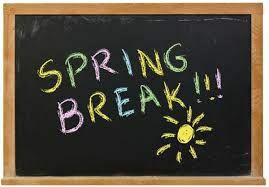 Penda's Implementation & Support Services Team put together some simple DOs and DONTs to support teachers (and schools) in executing successful student competitions / challenges, perfect for implementing just before your school's spring break. - Student Choice - keep in mind that while some students are extrinsically motivated, other students are driven intrinsically so striking a balance is key! Give students a choice to opt in or out for a competition/challenge. Not all students are motivated by peer competition, but might still want to have their own independent competition - comparing their progress and scores against top performing students. - Know Your Penda Data - take time to explore your teacher account to fully understand what data is available to you through the leaderboard (class and student tab) and via detailed Report views. This preparation will help you implement and execute your competition/challenge with ease and avoid frustration when it comes to pulling or analyzing data - there's nothing worse than starting a competition/challenge, only to realize you can't get the data you were hoping or wanting. For example, the leaderboard class points tab resets each month to promote competition, while the student tab shows total points earned by students since the beginning of the academic year. Currently, while class points are logged for each month, a date range filter cannot be applied. Thus, teachers must export class points before the start of the challenge and again at the end, if they wish to use this data. - Quality Over Quantity! In using Penda, the goal is for students to complete the activities with accuracy, so be sure to frame your challenge/competition around completing activities with a minimum score of X% (we recommend 80%). Create a competition that focuses on "green activities" (green = mastery, 80%+). - Whole Picture - consider holistic usage, taking into consideration task hours, average score on review activities, amount of time outside of school (4:00pm - 7:00am) **since it's outside of school, this truly is independent practice, total class points as presented on the leaderboard at the given time. Items 1, 2, and 3 listed can be found easily through your teacher account under "Reports - detailed," using the yellow status bar across the top of right pane. - Stick To The Plan - develop a competition with clear start and end dates, competition factors, and incentives then stick to it! Consider starting competitions/challenges on the first of the month and ending on the last day of the month. By doing so, you'll be able to easily monitor competition data points, such as the leaderboard (keep in mind the leaderboard class tab resets each month). -Visual, Visual, Visual - make a conscious effort to promote your competition/challenge visually. Reserve whiteboard/wall space to chart progress and recognize students. Display class points and update regularly to keep competitive spirits ignited. Recognize students throughout the competition/challenge period through verbal praise (MVP of the week, most improved of the week, etc) and whiteboard/wall space where student names can be placed onto once they reach certain thresholds. - Don't mandate that every student must participate. Instead, gain student buy-in. - Don't change the competition mid-stream, changing the target, start/stop dates, or incentives. Instead, stick with the plan full steam ahead. - Don't expect students to be excited about the competition/challenge if you aren't. Accommodate ESOL/ELL/LEP students using Penda Learning with just a few clicks of the mouse! View this self-help tutorial video to see how you can translate a Penda Learning math/science activity from English to any of the 100 languages supported by Google Translate via Google's Chrome web browser. 3 NEW MIDDLE SCHOOL SCIENCE FL TOPIC-SPECIFIC ACTIVITIES! MORE GREAT NEWS! Penda Learning's Content Development Team just created and launched 3 new middle school science Florida topic-specific activities that focus on the highly assessed benchmarks for FL Grade 8 SSA.